Just a short drive from the Oak Brook Promenade, Hair Club Oak Brook serves the hair loss needs of clients from communities all over the Chicago area, including Rockford, Schaumburg, Naperville, Aurora, Joliet, Kankakee, Gary and more. Visit Hair Club Oak Brook for a free hair and scalp analysis with one of our trained hair loss experts. Together, you’ll determine which of our proven solutions is right for you. Don’t wait another minute. Take the next step toward experiencing life in a whole new way with hair that makes you feel confident! Visit Hair Club Oak Brook today and take the next step toward getting your hair back. 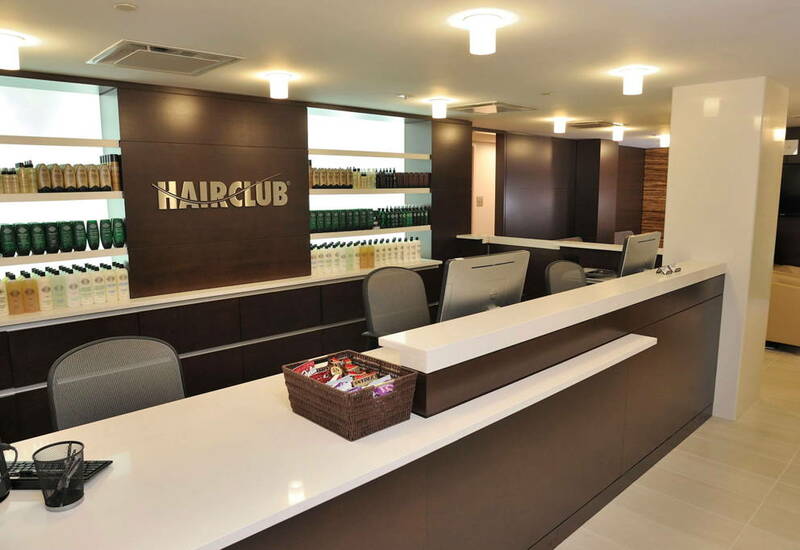 Hair Club Oakbrook is located across from the Comed building and by the Marriott Courtyard. IMPORTANT NOTE: The doors to the building are locked at 6:45 pm on weekdays and at 3:45 pm on Saturdays. There is no way to buzz up to the center once the door is locked, so it is imperative that you call if you are running late. · Stay on the right when entering the toll plaza. Erica joined Hair Club in 2015. She’s passionate about hair restoration because of the positive impact it has on people’s lives. Fluent in both English and Spanish, Erica helps Spanish-speaking clients discover the benefits of restoring their hair. Joe’s role is to deliver exceptional customer service and ensure all clients are treated like family each time they come to Hair Club. He joined Hair Club in 1987 and assists hearing-impaired clients as an American Sign Language interpreter. Natalie joined Hair Club in 2015 and is dedicated to helping clients achieve the look they want. She’s responsible for leading consultations, answering questions and learning what each person hopes to achieve through hair restoration. Awesome service.....representative are always nice and willing to go the extra mile to ensure a great experience. I am an ext client and have been coming to the hc for the last five years. Rosanne is my stylist and is such a wonderful person to work with. She listens to my concerns for my hair loss after my child birth and always does a great job. I am extremely pleased with the service and products at the Farmington, CT HCM. The hair systems have have never been so realistic and perfected. The parts, hairlines and quality of hair have improved so much over the years which is why I finally decided to become a client 10 years ago. My stylists are professional and can handle just about all of my pretty demanding requests. They listen and then can act accordingly to get my hair styled and looking great when I leave the office. I recommend this process to anyone and plan to continue as a client for many years to come. Thank You. I have been coming here for about 10 years and over those years i have had the pleasure of working with all the staff. They make coming in to get a hair cut a great experience. I have never had a bad experience. They are willing to bent over backwords to make sure everything is done right and you are happy with your hair. You can tell that everyone loves there job. It feels like one big happy family here and that translates to great service and I am happy to be part of the Oakbrook hairclub family. The staff (Julie, Mary, and Holly) are all wonderful. They make me feel very comfortable while I'm there. I look forward to my appointments. This staff is aces in my book! Next month, I will have been a customer of the Oakbrook Hair Club for twenty years. Can you believe it? It just seems like yesterday when I started to address my balding issue. Do I get a gold watch now? Ok, how about a pension? I have always inspired in life to do my very best, dress for success and look my best. While in my late twenty’s, I began to lose my hair which aged me by at least ten to fifteen years. My wife was very supportive of me to find a solution in order to regain my confidence and self-respect. I just needed to find the courage to do something. I originally considered the surgical route, which in reality could have saved me a considerable amount of money over the past twenty years. Instead, I went with a Hair Club system. I will never forget the first system and how I actually cried for fear of being ridiculed by family and friends. Much to my surprise, the change was well received and generated significant compliments. My very first HC stylist was very supportive and ensured that my hair services always met my expectations. These were some of my toughest times while adjusting to having hair again. You would think that it was a good thing to have hear but it needed to look natural. Once she left the company, I was again blessed to have another outstanding stylist who I have remained with for well over ten years. Chris has not only been a great hair stylist but a great friend as well. She knows my expectations and is always there to ensure that I look my best. Over the years, my monthly appointments at HC have become like visiting an extended family. Everyone at the Oakbrook store is always very friendly, outgoing and makes you feel like part of the family. Although it has been a major impact to our monthly budget, the cost of feeling good about yourself is something that you cannot afford to do. You and your team bring skill, you bring will, but most important you bring heart. You have made a difference in so many lives. You made a difference in mine. Thank you very much!! I have been a member for many years great service great people I am very happy. Niki and Joe I love you guys!! I have been a client for over 15 years and I cannot say how much I appreciate everyone there and the quality of the service I get everytime I walk through the door. I am always greeted by first name from the staff everytime and Joe always takes the time to play with my children when I am stuck bringing them to my appointments. I cannot forget to mention the quality of the hair systems, as well as, Chris the one that puts up with how picky I can be about how my hair looks and the quality of the service she provides for me evertime I am there. Thanks Chris and thank you HCM for making my day to day life a bit more comfortable. Niki, I just wanted to send you an email to compliment you &amp; your staff. I have been a client for over 20 years (about 15 years in Oakbrook) and have always been treated with the utmost courtesy and professionalism. Everyone at the Oakbrook facility, from the front desk to the stylists and management have always provided complete satisfaction. On the rare occasion when a problem arises with my system, you and Joe have personally made sure the problem was resolved. Thanks for for the many years of great service!! Everyone at the center is friendly and I always feel welcomed. Having worn a hair piece for over 40 years, I have found the Hair Club products to be the most natural looking and easy to care for. My only complaint would be the lack of consistantcy with the new units when they come in. Hair color and hair density seem to be a cronic problem. Thank to the staff at the center we are able to overcome these issues and I leave a happy camper. Great staff! I would reccomend to anyone! Comment I am excited about my results and would recommend this to anyone that is insecure about losing hair. Oustanding customer service. Friendly, make everyone feel welcome. I am client in Oakbrook, I am very pleased with your product and services. I've been a client for 3 years and I am so very happy. Scott has been a huge support since day one. Rosanne is a lot of fun. I feel comfortable and happy when I am there. My hair looks great and I feel great. Thank you to the entire staff. "Over the years, the staff at HCM Oakbrook have become like family to me. Everyone from the General Manager to the Sales Consultant, my stylist and the girls at reception are the most professional and sincere that I've ever had the pleasure to associate with. Based on my experience, I would have to give the entire staff at HCM Oakbrook an 11 on a scale of 1 to 10!" Hi Niki: As always, great to see you and all your colleagues yesterday. Now that I am retired, one tends to think about the past more. Having said that, I want you to know how enjoyable all my appointments have been with HCM. After being a client for 20 years, yes 20, I can honestly say I really look forward to my visits. You have built up a great staff that is fun, courteous, well trained, and always on time. When I leave I feel really good and some would say I look pretty good with hair. I am one of the ones who would say that. Thank you and your staff for taking good care of me all these years. All the best to you in the upcoming year. A Happy Client John L.
Happy with the service. Very friendly and professional. I have been a customer of the Oak Brook Hair Club for nearly a decade. I have always been treated with professional respect when at your salon. Not only are the team members friendly and kind, but they are also professionally skilled in their craft. Your club is ways clean and inviting....the seasonal decorations are noticed and appreciated! My main points of interface are Joe, Liz and Roseann, but throughout the years I've had the opportunity to visit almost everyone....why so many? Because my schedule is sometimes NUTS, yet the great customer service "kicks in," and I am worked into someone's available time. One other component of the Oak Brook club that is important to me is the stability of the staff. I LOVE knowing that "my" hair professionals will be there for me month-after-month...this MATTERS! Joe, Liz, Roseann and Mel have become trusted friends and I enjoy the added bonus of their talents. They help me look and feel better about myself; and for this there are not adequate words to express my appreciation to this Oak Brook team. I feel fortunate to have this luxury and more fortunate to go to this hair club. "Thanks" for all you each do in making life happier, and more beautiful, for so many! -Anita A. Going to Hair Club is the best thing I have ever done for myself. Never been happier than the way I look and feel now. i travel a majority of the time for work so i get a chance to visit their many centers. the stylists were more than accommodating and give terrific service.